As a pattern designer and passionate sewer, sometimes I get so inspired by an idea I just have to see it through until it's done! Everything else on my sewing/pattern drafting 'to do list' got pushed aside over the weekend and I decided to make this dress. I had been inspired by pleated bodices worn by an Australian newsreader (Janice Peterson for my Aussie SBS viewers!) for over a year and wanted to make one in girls' sizes. I needed over a metre of fabric for this dress and landed on this beautiful black floral I had been hoarding for about 18 months (fabric details at the end of the post). 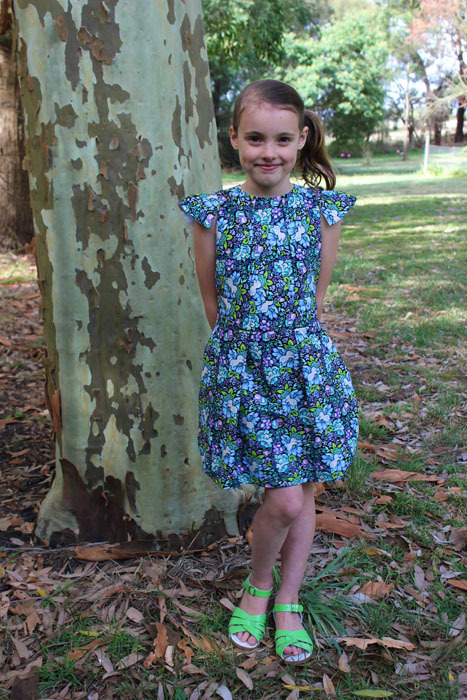 Isabella had ear marked it for herself and so I turned it into this dress which she absolutely loves (always a win now that she has become more discerning over what she wears)! The sleeves were a bit of an experiment and didn't turn out exactly as I intended, but I still like them! Next time they will look a bit different . I made the skirt slightly 'cacoon' style - shaped slightly at the bottom...which begs for some inseam pockets. I love that inseam pockets can be completely hidden - especially in a floral like this! If you are looking to find yourself some of this beautiful fabric, it seems to be as rare as hens' teeth now. I bought it a while back from Hawthorne Threads. It is called Overachiever in charcoal by Anna Maria Horner. HT do stock it in the 'forest' colourway, but I think the black is really outstanding. I googled the fabric and found a metre here and there on etsy, and maybe you will have more luck finding some! My love for black floral continues! Overall I am very happy with how the first sew in this design came up - lucky, since I risked the experiment with such pretty fabric! I am excited to try this pattern again - with the adapted sleeves and a couple of other different details I have planned! Oh Suz, what a wonderful and successful experiment! I love pleats, so of course I am admiring this dress! I think Isabella looks a lot like Natalie Portman in the last pic! I wonder how this dress would look in a plain fabric, because I think I'll love all the details even more when they're more visible. But I already love this one, and I'm really looking forward to hear what you've got in your mind for the future of Sewpony! Thanks lovely Eva😄 Yes my next dress is in light fabric so I am looking forward to showing off the pleats more .